These 12' blue rounded commercial mats are great for both indoor and outdoor placement where they can absorb dirt to keep floors clean. Each of the area rugs is made of durable polypropylene fibers that resist the growth of bacteria and mold by drying quickly. In addition, the blue rounded commercial mats feature a rubber backing and are Certified Slip Resistant by the National Floor Safety Institute. 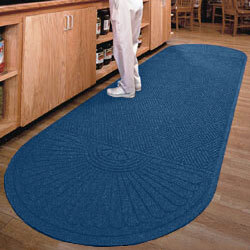 The carpets are an ideal choice for offices, warehouses and homes and they're anti-static rated by the AATCC as well.